NAGO, OKINAWA PREF. - As the Japanese government intensifies its crackdown against demonstrators blocking construction of a new Pentagon base in the Henoko district of Nago city, Okinawa, a senior U.S. Marine Corps spokesman has weighed into the fray by accusing peaceful protesters there of faking their injuries. On Jan. 22, Capt. Caleb D. Eames, deputy public affairs officer for the Marine Corps Installations Pacific, likened demonstrators to play-acting professional soccer players: “The attempt to appear injured is laughable when you see it in person,” he said. 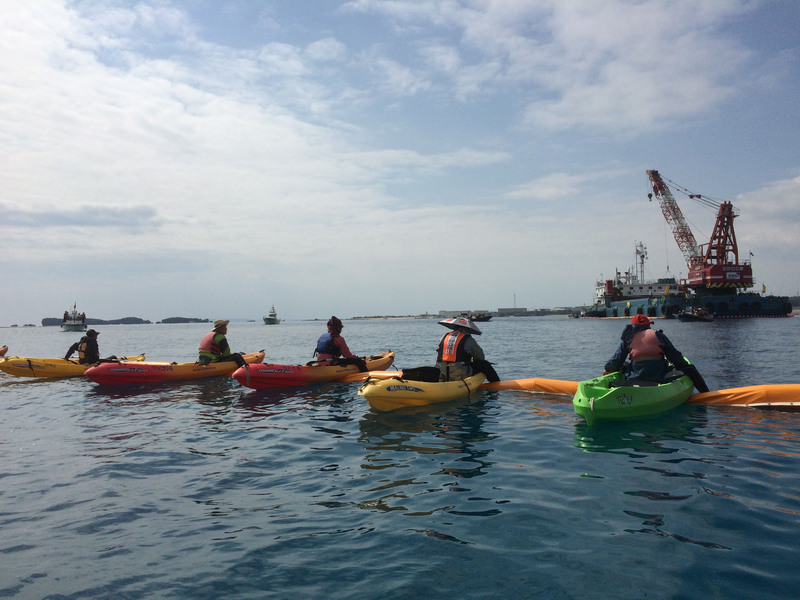 Since the Japanese government restarted its survey work last year on the long-stalled project to replace Marine Corps Air Station Futenma, Okinawan demonstrators have been attempting to block the work from both the sea and the land. 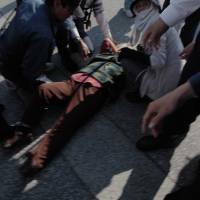 According to Nago city’s U.S. Base Affairs Section, between last November and Feb. 4, 12 demonstrators were injured by the police and Japan Coast Guard — five of whom were taken to hospital by ambulance. Injuries verified by Nago include a man whose rib was broken when he was shoved in the chest by a member of the Coast Guard on Jan. 16 and a 49-year-old man injured by the riot police on Jan. 23 who was left with injuries to his hand that he will take a month to recover from. Given this long list of injuries, the Marine Corps’ accusations of fakery have infuriated many protesters. “Almost every day, demonstrators are being injured on land and sea. Bloodied heads and broken bones. 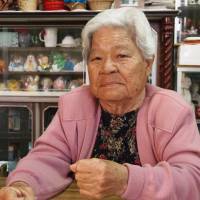 These are not the kind of injuries people can fake,” Fumiko Shimabukuro, 85, told The Japan Times. On Nov. 20 last year, Shimabukuro — a survivor of the Battle of Okinawa — was knocked unconscious while attempting to block a construction truck entering the new base site. 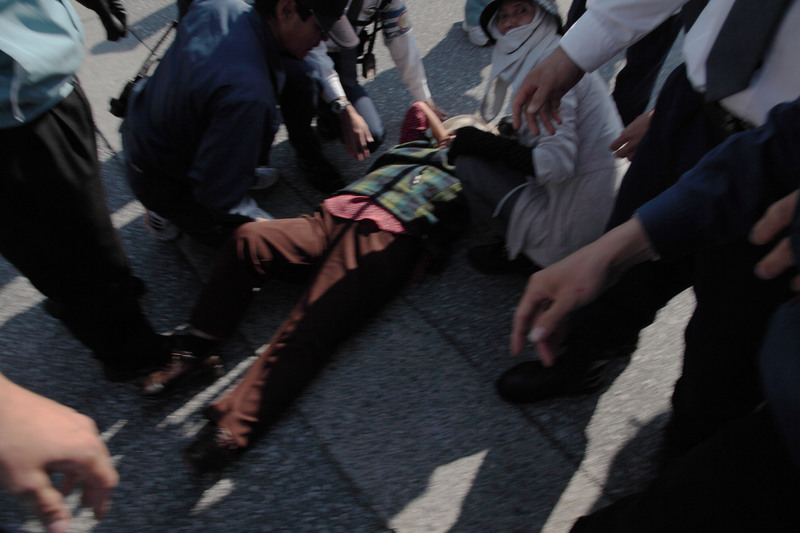 According to Shimabukuro and others on the scene, as she was holding the side mirror of the stationary vehicle, three riot police officers tightly encircled her, unpeeled her fingers and then, in a tactic that demonstrators say is common, they simultaneously stepped back, causing Shimabukuro to fall to the ground. Knocked out, Shimabukuro was rushed to a local hospital, and she says the injury has left her unable to sleep or stand without pain. Now Shimabukuro has thrown down the gauntlet to the U.S. Marine Corps. In his Jan. 22 email, Eames also accused anti-base demonstrators of “jabbing American employees with sticks” and “yelling English profanity and curse words” at his children. On Feb. 8, The Japan Times contacted Eames to offer him an opportunity to clarify his Jan. 22 accusations against Okinawan demonstrators. The alleged brutality against demonstrators is seen by many on the island as part of Prime Minister Shinzo Abe’s bid to project a more aggressive image to opponents both abroad and domestically. In 2004 and 2005, peace campaigners successfully blocked government surveys on the new Henoko base site, forcing Tokyo to abandon the work. However, now, under Abe, the government appears determined to push through with the controversial project — even if it means resorting to violence against peaceful demonstrators. 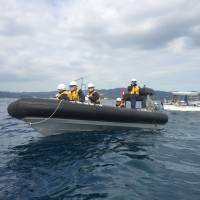 In Henoko Bay, the government has established a temporary exclusion zone marked with orange buoys and enforced by dozens of Coast Guard speedboats. Members of the Coast Guard immediately board any vessels entering the zone and, in the case of canoes, they forcibly drag their occupants onto government boats. 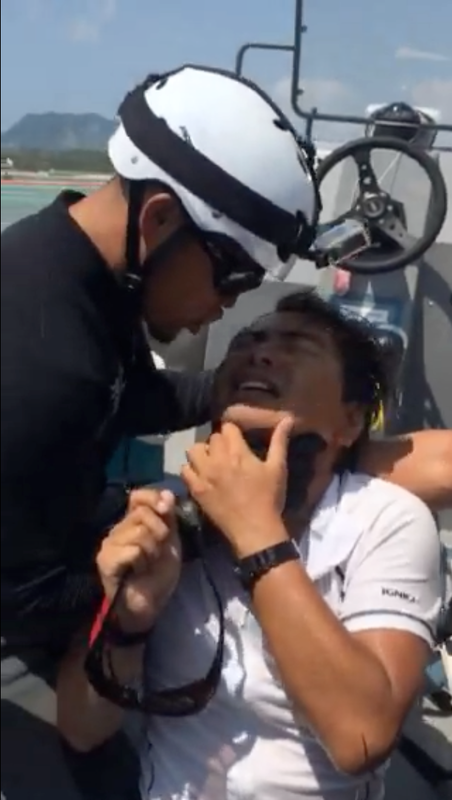 During one such incident caught on video last September (viewable above), a member of the Coast Guard is seen grabbing a canoeist by his throat and screaming incomprehensibly into his face. The assault left the demonstrator with injuries to his neck that required two weeks to heal. “The Japanese Constitution allows us the right to peaceful protest. But (the coast guard) grabbed the young man and started screaming in his face. We worried he was going to kill him,” Chie Miyagi, the Okinawa resident who took the video, told The Japan Times. Increasingly, the Coast Guard is targeting members of the media attempting to film its confrontations with demonstrators. Last month, the Coast Guard dragged a boat carrying journalists from the area. Then, on Jan. 20, a Coast Guard member caught documentary filmmaker Asako Kageyama in a leg lock and apparently tried to seize her camera. Although the incident was caught on film by local media, the Coast Guard issued a statement in which it claimed its member was merely attempting to pass Kageyama on his way to the back of the boat. On Feb. 2, the Coast Guard introduced a new — and potentially lethal — tactic. According to reports verified by Nago city, after detaining eight canoeists in shallow coastal waters, the Coast Guard took them more than 4 km from land where it released them — forcing them to paddle back to the shore. 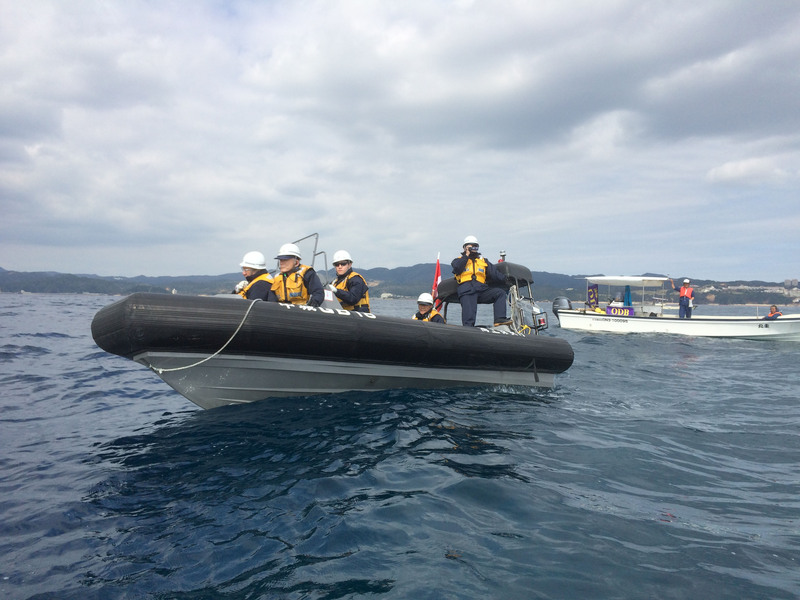 It repeated the tactic on Feb. 3, capturing 19 canoeists then releasing them into rough seas 4 km from shore. Higashionna believes that the Japanese and U.S. governments are ignoring the democratic will of the Okinawan people. In November, Gov. Takeshi Onaga was elected by a landslide on a platform to block the new base, and in December all of Abe’s Liberal Democratic Party incumbents in Okinawa were defeated by anti-base candidates in Lower House polls. Since winning his gubernatorial election, Onaga has been repeatedly denied meetings with Abe and Chief Cabinet Secretary Yoshihide Suga. Last month, the central government also cut the prefecture’s budget in a move widely seen as collective punishment for residents’ election of candidates opposed to the new base. “The only reason Tokyo is pushing ahead with the base project is discrimination. If this were America, such a project would never be allowed. Nor would it be allowed on mainland Japan,” says Higashionna. This year marks the 70th anniversary of the Battle of Okinawa, in which more than a quarter of the island’s civilian population were killed in the crossfire between U.S. and Japanese forces. 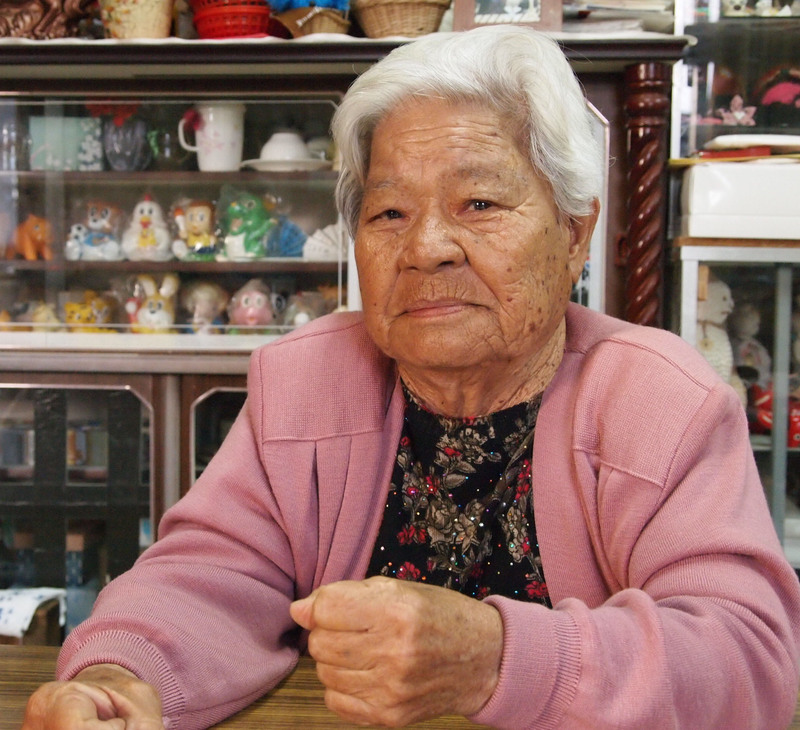 Today, many Okinawan survivors of World War II are involved in the new battle to stop construction at Henoko — among them 85-year-old Shimabukuro. Badly burned in the war while sheltering in a cave in southern Okinawa, Shimabukuro was treated kindly by U.S. troops who fed her and tended to her injuries. However, along with many other Okinawans, that sense of gratitude has been eroded by decades of land seizures, crimes and accidents. 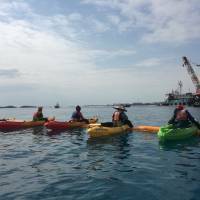 For many, the plan to build the new Henoko base is the final straw.